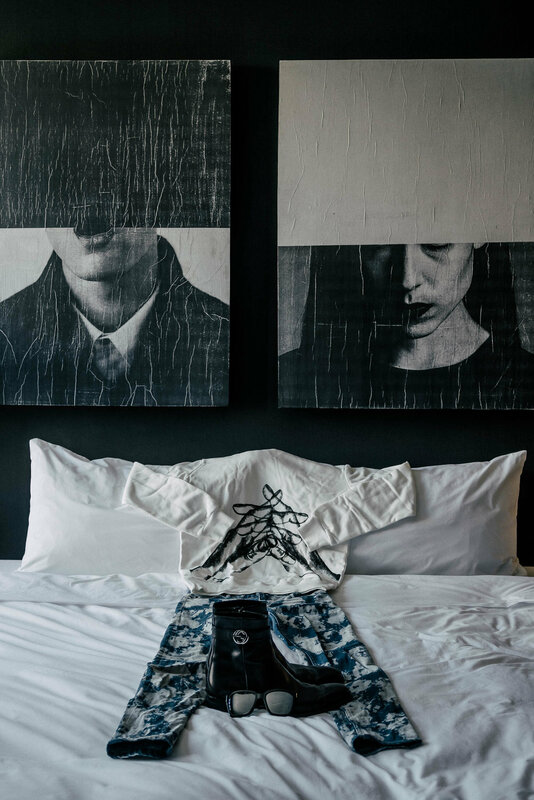 My Downtown LA Secret: The Tuck Hotel — MYBELONGING - High Fashion, Menswear Streetstyle Meets Food, Travel and Editorial Experiences. The Tuck Hotel is one of those tucked-away gems that I want to keep a secret from everyone else, simply out of selfish reasons. You would too, once you’ve had the chance to experience it. It’s a hidden retreat that occupies a traffic-laden stretch of DTLA, right across from Verve and adjacent to Terroni. Just one of my many, favorite establishments in DTLA. An urban oasis is a hot marketing term that is normally thrown around just to generate something buzzworthy, but the Tuck Hotel embodies that in spirit and architecture. It literally is a home away from home; this certainly takes on a personal meaning for me as I live only a short 20-minute drive away from Downtown LA. I love how upon checking-in, you’re greeted with a signature cocktail from the bartender instead of a receptionist. Each room is individually curated and decorated by the owner, further reinforcing an atmosphere that is equal parts luxury and cozy. Gucci boots. MCM luggage + backpack. Luna Blanche sweatshirt + sunglasses. ASOS jeans. Gucci boots. Fig + Yarrow complexion water. Dr Jart green tea mask. Viktor & Rolf aftershave. Elemis eye gel. Olika hand sanitizer. Time and time I’ve said staycations are the ultimate definition of relaxation for me. The less mobility, in my opinion, the better. Convenience above all. An escape without a queue, traffic and screaming babies is exactly what you need sometimes, or all of the time. I can’t think of a better way to just spend quality time alone, quietly cooped up in an en-suite room, to reflect, to write, to photograph. To contemplate tough questions about identity, the universe and what you're about to eat next. And then to later, slinky down the elevator and find yourself inside one of the chicest restaurants you've laid your eyes on. There's a certain kind of magic that occurs when you become that anonymous tourist in your own neighborhood. Isn't it time you rediscover that? Book your room here.